Realm of Horror - News and Blog: GREMLIN! comes to US VOD July! Emmy Award winning director, Ryan Bellgardt’s (Army of Frankenstein) highly anticipated creature feature Gremlin hits US VOD outlets from July 11 from Uncork’d Entertainment. Adam receives a mysterious box from a relative containing a creature that will kill everyone he cares about. The only way to be rid of the curse is to give the box to someone he loves. As the ominous timer on the box counts down to its end, he can only imagine the horrors that await. Does he give the box away to save his family, or unleash a monster upon humanity? 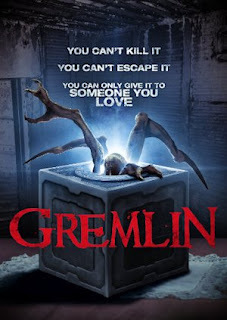 Adam Hampton, Kristy K. Boone, Catcher Stair, Katie Burgess, Mike Waugh, and Caleb Milby star in Gremlin, available at US VOD outlets from 11th July.